The TaDa design process is described by a diagram made up of triangular tiles and interfaces between them, shown in Figure 1. 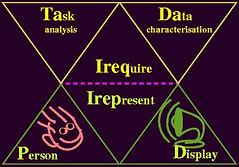 The design brief is shown by the interface between the Information Requirements (Irequire) tile and Information Representation (Irequire) tile. The auditory part of the design occurs at the interfaces between the Irequire tile, the Person tile and the Display tile. The Person tile focuses on the auditory perception, cognition, and mental context of the user. The Display tile focuses on the sonification technique, technical aspects of the sound synthesis and rendering, and the acoustic environment.